It’s time to start looking at all of these mass shootings from a big picture perspective. It’s not just about terrorism, or gun control, or hate crimes. It’s about how American society is, slowly but surely, dehumanizing people. All of these opinions are voiced, which is inherently not a problem, except instead of voicing them to try to seek understanding, we voice them aggressively, with the intent of proving someone else’s opinion is wrong. So what is the result? More division. More anger. More hatred. Let’s stop arguing over why each individual crime occurs and take a second to look at the bigger picture. 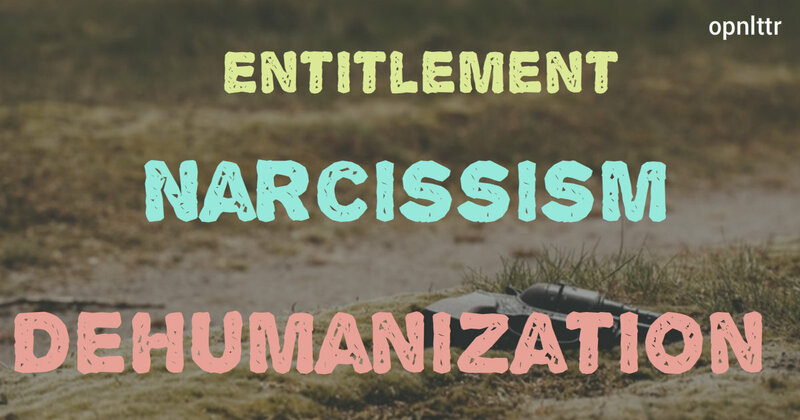 Our culture is one that has developed into a society of entitled and narcissistic individuals. To me, this aspect of our culture has become silencing. I don’t want to voice an unpopular opinion because I don’t want to be misunderstood and given a label that I don’t feel defines me. To others, it fuels a fire in them, and it makes them want to push their opinion down the throats of others because it makes them feel powerful. Everyone wants to be the vigilante who gains a following and gets people to listen. Conflict seems to be a staple of living in America. To disagree means our constitutional rights are preserved. Which is true, and even good, I suppose, if you take out the fact that people are killing each other over it. We see each other as words, opinions, and beliefs rather than as well-intentioned people with families and goals. As a child, I thought that if I stayed out of trouble and went out of my way to be kind to people, that I wouldn’t have to worry about dying young. Now, my heart aches at the number of people who have just gone out and enjoyed a fun evening with their loved ones at the movies, a dance club, or a sporting event, and not come home. Even the police aren’t safe—as many are targeted simply because of the uniform they wear. One bad police officer makes some Americans feel they will get justice by murdering 3 innocent ones. These are examples of dehumanization. Social media doesn’t help the dehumanization process. Read any Yelp review, and you will find someone who rates a restaurant 1 star and gives a full page rant with expletives all because the server had 14 tables at prime time dinner hours and didn’t clear the plates fast enough. Watch any video of a beautiful, talented singer on YouTube, and you’ll find comments about how her shirt is ugly, and why would anyone wear their hair that way? View any Instagram account of a person who has lost 50 pounds, and you’ll see the comment on their progress picture that says, “Sure, but you’re still fat. Put a shirt on because no one wants to see that.” Even this open letter will be offensive to some, who will comment and rant and be upset that I have this view of our society. It is inevitable that everything will be controversial to someone. Our society thrives on being offended, being angry, and being mean. We sit behind our computer screens, enjoying our freedom, and use it to hurl epithets and insults at people we have never met and will never meet, just because we feel entitled to share our opinion. These are people who have never done anything to hurt us and don’t seek us out, yet we go out of our way to cut them down and hurt them. The victims of these mass shootings have never met their killers. They did nothing to hurt them. Why does your opinion need to be voiced? If something offends you, simply don’t look at it. If you disagree with something like gay marriage or abortion, then don’t take part in it. If you are being sought out and harassed by someone, then of course, voice your concern, but in a constructive way. But this “right” to having our own opinion has somehow caused a sense of entitlement in forcing everyone else to agree with it. Consider our role models in mass media. The majority of television shows are reality shows that survive solely on the presence of a “villain” who stirs up drama, or sitcoms that are driven by self-deprecating humor. Shows lose ratings and are canceled if they aren’t based in sarcasm, lewd wit, or if the laughs are not at someone’s expense. The reality shows thrive on the “mean girl” characters that undercut and belittle their friends, or the “hot head” guys that start physical fights when someone offends them. These altercations are the highlights that we see on the previews for these shows because American society is captivated by it. We relish in the drama and the conflict. And while we can all say that we watch for entertainment and would never act that way in real life, there are people who see those characters and long for the attention they get, or see them as darkly funny. Why are we surprised when copycat crimes occur after tragedies? Our society has evolved into one in which narcissism makes us all want to be noticed, even if our fifteen minutes of fame is as a villain. That’s why trolls on social media say the things they say. They genuinely feel that their opinion is going to have some impact on someone, and it’s worth it if that impact is negative. Is this mindset really that different from the mindset of these killers? How is it different from the process of the men and women that have slain dozens of innocent people, just for existing and representing something that the killer doesn’t like? The “special snowflake” concept in raising children is also not helping the issue of narcissism and entitlement. While of course it’s important to love and nurture your child to provide them with the best life possible, I have a real fear of what our culture will be like as the current generation of children grows up. Every child IS unique, and every child DOES have good in him and special talents to share. However, parents who will do anything to prevent their children from failure, accountability, and personal responsibility are hindering their children from success in the real world. Parents of college students are phoning professors to negotiate the grade of their 20-year-old because the professor must have obviously been biased and unfair. They yell at other parents in the park for asking their child to please stop hitting other children. They assist their children in relying on instant gratification. These children never feel a moment of discomfort because the parents are always ready to give them something to do when they are bored, a reward when they are good, and deflection when they are bad. These children never learn how to problem-solve or self-soothe because they don’t have to. And then when they grow up, they don’t know how to manage life when it doesn’t go exactly their way. Many children are being sent the message that a problem is always someone else’s fault. That they only acted that way because someone else “made them.” That any time they do something wrong, it can be justified by someone else’s actions. To me, this sounds like entitlement and narcissism. Parents are teaching children that it’s okay to hurt people (physically or emotionally) as long as you have a good reason, like perhaps the caregiver wasn’t watching closely enough, or there aren’t signs and placards that explicitly say you can’t hit people. Seven-year-old children can kick and punch their teacher and principal with a consequence of simply missing recess for a day. Where is the concern for the welfare of those adults? This child is learning that other people don’t have feelings or loved ones or personal lives, and they are learning that their actions don’t impact others. The excuses are, “he can’t help it,” “you triggered him because you didn’t give him what he needed,” or “he’s still too young to understand.” The child is not too young to understand the message that is being sent: it’s okay for me to be violent because I was mad. We, as Americans, love conflict. We love to argue. We love to complain. We love to be offended because it gives us our “right” to argue our opinion. And while everyone sits on their computer and posts to Facebook about their view being the only acceptable one, our culture continues to become more and more divided. The arguments over beliefs that begin online are the same ones that escalate into violent action. It’s easier to be mad at someone than it is to listen and understand. I know that I may be contradicting myself by sharing my opinions online. But I’m not trying to force them on anyone. Feel free to disagree with me. But do not mistake my opinion as a vicious personal attack on your beliefs or parenting style. I don’t know you. This letter is to no one in particular. Do not lash out at me for sharing my thoughts and feelings. I have no agenda; this is simply a cry for people to consider something other than political issues in helping our nation get back on track. We could make so much progress if we would stop to listen to one another and work together instead of causing more conflict. Right now, we are taking the cowardly way toward reform in this country—hiding behind technology, blaming others, and acting like we have all the right answers and no one else matters but us.